It's officially on. 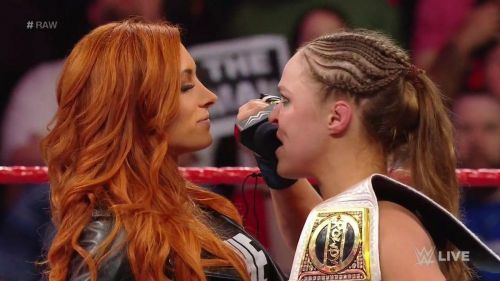 "Rowdy" Ronda Rousey vs Becky Lynch has already been confirmed for WrestleMania 35. This means that we already have our first WrestleMania bout confirmed. It's crazy to think that the two were supposed to face off at Survivor Series in 2018 in a Champion vs Champion match, but Becky Lynch got pulled in the week of the event due to a concussion in the hands of Nia Jax. However, in hindsight, that turned out to be a blessing in disguise. The final shot of that RAW was Becky Lynch standing tall with a busted up face. That actually helped her get more over, so much so that her losing the SmackDown Women's title didn't affect her one bit. Now, she's all set for a blockbuster match at the grandest stage of them all against the biggest star of the women's division. Last year she was on the pre-show and this year she's in the marquee title match. With The Man being hotter than ever, let's take a look at five reasons why she chose Rousey at WrestleMania. Becky Lynch will be entering her fourth WrestleMania and you might be surprised to learn that she's been in title matches three out of four times. The first one was at WrestleMania 32 against Charlotte Flair and Sasha Banks, and the three women absolutely stole the show. 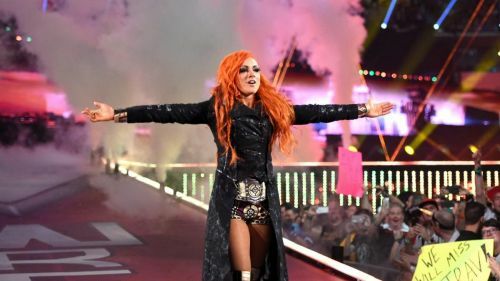 The second one was in the co-main event of WrestleMania 33, but it was a short, underwhelming SmackDown Women's title match, and Becky Lynch was a clear afterthought then. The following year, she was in the battle royal and was in complete creative limbo. This year, however, her marquee match against Ronda Rousey almost certainly means that she'll be in the main event of WrestleMania!